The graph tells you just how important oil is to the Russian elite. It shows the world’s thirty largest economies (on this graph I have, somewhat prematurely and I hope incorrectly, separated the UK from the rest of the EU). Gross domestic product (GDP) is on the horizontal axis; the horizontal scale is logarithmic, so GDP doubles from one tick to the next. The vertical axis shows the value of net fuel exports (oil, coal, natural gas) as a proportion of GDP. You can see that most large economies are net importers of fuel; Russia is the largest economy that is a net exporter of fuel, and it is also a major net exporter: of countries with GDP of over $1 trillion, Russia is far and away the most dependent on exports of fuel, at about 17% of its GDP; of the $1 trillion-plus economies, Canada [CAN] came second in fuel export dependence, at less than 5%. 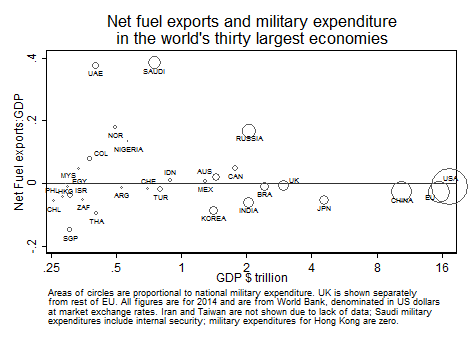 Among all the top thirty shown here, the only ones more dependent on fuel exports than Russia are Saudi Arabia and the United Arab Emirates (Iran should be on the chart but data is not available). GDP is the market value of a country’s combined consumption, investment and government spending – all the groceries, all the new buildings and equipment, all the heating bills, all the government services… everything that’s paid for in the country: for net fuel exports to be worth 17% of that for such a large country is staggering. For the US, for example, total exports of all goods and services comes to only 13.5% of GDP. The elites of most other fuel-dependent countries are in the same position as Putin and the Russian oligarchs – serious action on climate change would break their rice bowls. But Russia has power that the others lack. It has largest military budget of any fuel exporter: the circles in the graph are proportional to military expenditure, so big circles mean big armies. Saudi Arabia does have a big army, but the Saudi circle is inflated reporting of its considerable internal security spending together with military. And Russia is the only net fuel exporter with nuclear weapons. Russia also has a large population – excepting Nigeria, Russia has by far the biggest population of any substantial net exporter – and Nigeria is a poor country with negligible military and technological capability. And, in addition to its own resources, Russia controls the flow of natural gas from the former Soviet Republics of Central Asia to Europe – control that it’s shown itself willing to use against its neighbors. Russia, as a country, could adjust well to life after fossil fuel. It has an educated population, a good technological base, and climate models tell us that it is likely to be relatively unharmed – perhaps even helped – by climate change for decades to come: without oil exports, it could easily find new sources of comparative advantage, new roles in the international division of labour. But that would be cold comfort for Putin and his circle of oligarchs. Like autocrats, plutocrats and corrupt officials around the world, they love oil, coal and natural gas because they can abstract large cash incomes from these industries without hindering production (in technical terms, most of the revenue from oil is rent); if they tried to squeeze such emoluments out of most other lines of business, they would only squeeze the businesses to death and be left holding dead geese, not golden eggs. Trump, or the Republican Party? In climate policy as in all other things, Trump’s personal arbitrariness and outrageousness are so vast that they fill the whole frame, and make it hard to look past the individual to see who backs him. But his dismissal of climate science, and of international efforts to cooperate on mitigation of global warming, are completely normal for today’s Republican Party. If the Republicans stick to the positions they have articulated over the past decade, the US will line up with petro-states like Russia and the Gulf monarchies, to block meaningful action on climate. Trump is the political heir of the Tea Party, that ostensibly grassroots Republican movement of the Obama years which was in fact funded by the Koch brothers, oil billionaires who are also among the biggest donors to Republican candidates. In principle the Tea Party was for small government, anti-tax, pro-market, pro-gun, nationalist, and in favour of some sort of “traditional” values. Yet, for reasons that don’t follow logically from the rest of this agenda but which are not entirely mysterious given the identity of its sugar daddies, one of the Tea Party’s greatest bugaboos was environmental policy, and in particular any hint of international cooperation on global warming: the idea that climate change is a serious problem and caused by humans was denounced as a pernicious fabrication, the fruit of an implausible conspiracy in which numerous national governments suborned a large community of scientists to advise them to do something the governments manifestly do not want to do; the UN’s Agenda 21 program for sustainable development was presented as a sort of collectivist-globalist plot to destroy the American way of life. During this same period the US Supreme Court’s Citizens United decision removed most practical limits on corporate money in American political campaigns, and Republican candidates quickly became dependent on (and fearful of – step out of line and you get a challenger in the next primary) fossil fuel funding. All industries, of course, spend money to buy favours, but the fossil fuel industry is both very wealthy, and threatened with annihilation: to prevent the climate from moving into territory which presents grave risks both to humanity and to the diversity of life on the planet, we need to achieve a rapid and sustained reduction in human contributions to greenhouse gases. For that to be accomplished with technologies which now exist will require a sharp drop in the use of fossil fuels. For those in the fossil fuel business, that means selling far less, selling it for a far lower price, and leaving most “assets” stranded and worthless in the ground. They will spend what they must to postpone that day. In the wake of Citizens United, most Republicans in Congress have become climate science “sceptics”, denying their own ability to understand climate science themselves (“I am not a scientist”, as Marco Rubio and many others have intoned to justify their claims of ignorance), and at the same time unwilling to accept the advice of scientists. The exception that proves this rule is an initiative by the Climate Leadership Council. The public faces of this group are all Republican elders, veterans of the cabinets of Ronald Reagan and the two George Bushes, and they are bent on persuading Trump to support a carbon tax of $40 per ton. Their sales pitch correctly notes that such a tax, rebated to the public – the group proposes equal distribution among US citizens, paid directly to personal bank accounts – would provide powerful encouragement for CO2 reduction and green investment, that it would leave most citizens better off financially, and that it is consistent with a small-state, market-friendly philosophy. The invidious qualification that these are citizen’s bank accounts – the non-citizen 7% of the population would pay the tax but see the rebate go to others – is meant, one supposes, to appeal to a Tea Party mindset. But, while we can quibble over the details of their plan, on balance this is a worthy effort: I wish them luck, which they will need, for it is not auspicious that these elders, like most other prominent Republicans supporting real action on climate (Arnold Schwarzenegger is another), are people who retired from politics years ago. Among people who are not Republican Party leaders, the relationship between age and support for action on climate is the exact reverse, with younger people far more likely to support action than older ones; but people who are not Republican Party leaders do not need Exxon’s support to keep their jobs until pension age. The oil-backed politicians of both America and Russia will do almost anything to sabotage serious action on climate change. One important tool they have found for this is nationalism, and with it the demonization of international cooperation. Nationalism is not of course something they invented, or a genie they can summon at command; nor did they fabricate the broader reaction against the reduced accountability of national governments in the face of global markets, the reduction in social mobility, the geographical polarization of opportunity within countries, and the strangeness of a world full of people uprooted and moving – these are all things that people would care about without the urging of the Koch brothers or Putin or their friends among the media proprietors. But political movements can be shaped and steered by money and by media resources, and this is what has happened. And so we have oil and media barons leading a “popular” revolt against international cooperation. Without international cooperation, climate change will not be brought under control, and oil fortunes will be safe until the planet cooks. Nowhere is the link between the new nationalism and the sabotage of climate action more clear than with the attacks on the European Union – by Trump and by Putin; by the Brexit campaign – it is not simply coincidence that so many of its leaders were climate “sceptics”; by various right wing nationalist parties in Europe aided by Putin. We might see hostility to the EU as simply a territorial interest on Putin’s part – with a weaker EU he could exert more influence, and grab more land, in Eastern Europe. But his power is more in the ability to sell oil than in the land he controls, and his common interest with the Republicans is to undermine the European Union’s contribution to agreement and action on climate: the EU brings 28 countries, comprising most of the world’s rich industrial countries, together in one policy and negotiating unit, and it has been relatively successful (against, one must admit, pretty feeble competition) in cutting its own emissions. In a world where the EU, US, China and India can sit at one small table we can at least imagine an avenue through which realistic deals can be done, and enforced. If Europe breaks up, or becomes immobilized by internal conflicts, while the US turns its back on international cooperation, there will be no coordinated action on climate until we are well committed to a 4 or 5 degree C rise from pre-industrial levels – a rise which experts agree is extremely dangerous. This entry was posted in Climate, Environment, Extractive Resources, Locality/Nation state/Region/Globe, Political Economy and tagged Brexit, climate change, European Union, Joe Romm, oil, Putin, Republicans, Russia, Trump by Frederick Guy. Bookmark the permalink.